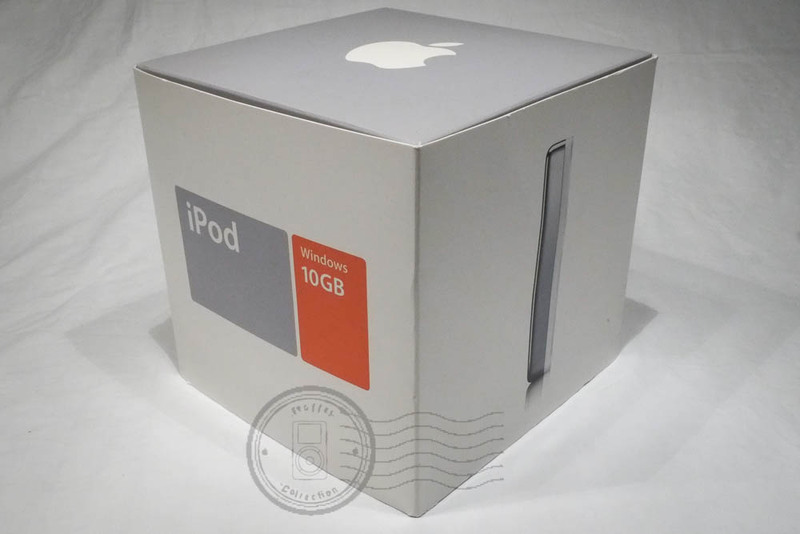 The sleeve around the box to the second generation iPod was very different from the first version. The font was changed to sans-serif Apple Myriad. The front side of the sleeve had a gray field and an orange field. In the orange field you could see the hard drive size and if the iPod was a windows or mac configuration. The inner clam shell box wasn’t silver any more, but light gray instead. A torned sticker on the box masking the serial number always makes me a little suspicious. My guess is that the iPod doesn’t belong to the box. Someone had a nice box and someone else had a nice iPod. An iPod isn’t worth that much, and an iPod box isn’t worth much either, but together they are worth plenty. Or it could be a case of bad luck and a retailer putting an ugly sticker in the wrong spot. Any way I try to stay away from boxes like that. The interior was made up by rigid transparent plastic. The wired remote was placed under the iPod to the right. I’m not sure if the earbuds were to the left or right in the box.